These Plastic 18 Oz. Coconut Cups and 12 Oz. Coconut Coolers with Straws are perfect for tropical theme events, tropical drink nights, clubs, fraternities, sororities, promotions, and much more. Our Custom Coconut Glasses add a unique and fun touch to any event. Choose from a range of glass colors with the imprint color(s) of your choice. To order your Custom Coconut Glasses, please call 1-800-233-0828 and then e-mail us your camera-ready artwork. Turn-around time is about three weeks after proof approval. Rush production and delivery is available for an additional charge. 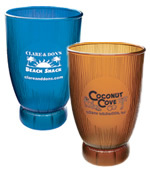 For a more information on our Customized Drinkware, please contact us at 1-800-233-0828.